Metrolink train cars are seen on their side after a crash in Oxnard on Tuesday, Feb. 24, 2015. 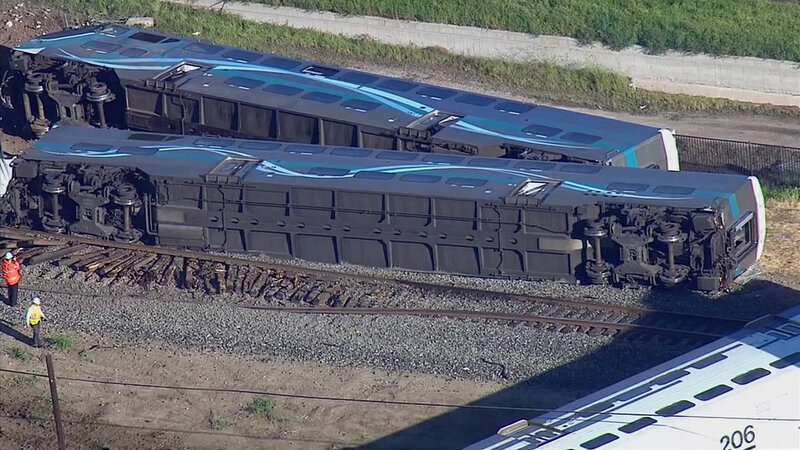 OXNARD, Calif. -- A 54-year-old truck driver from Arizona was arrested for felony hit-and-run after a Metrolink train headed toward Los Angeles struck a large pickup truck, which was hauling a trailer, on the tracks in Oxnard. No fatalities were reported, Oxnard police said. Ventura County Line Train 102 crashed at about 5:40 a.m. near 5th Street and Rice Avenue. The vehicle caught fire after the crash. The driver managed to flee the scene, Oxnard fire officials said. An officer spotted a man walking on Rice Avenue about a mile south of the accident and determined that he was the driver. He was identified as 54-year-old Jose Alejandro Sanchez Ramirez. "It appeared that he was very distressed. The person appeared to be disoriented and on the phone," Oxnard Assistant Police Chief Jason Benites said. The man, who was not identified, was not injured, but was taken to a hospital for observation. He was arrested following his release from the hospital. Benites said the truck appeared to be traveling southbound on 5th Street, and in attempting to make a right turn onto a street, instead turned onto railroad tracks and got stuck. It was unclear if the area was part of his regular route. Before the crash, the train was leaving from the Oxnard station. With two miles of straight tracks, the driver of the train was able to spot the vehicle on the tracks early and pulled the brakes and provided warning signals. Authorities said the train had been going eastbound slower than 79 mph cruising speed. Upon impact, five cars derailed, including three seen on their side and two upright, fire officials said. "It just seemed like slow motion. It seemed like it took forever," said passenger Joel Bingham, who was not injured. "We did what we could and we're lucky. We're lucky we survived," passenger Guy Basile said. 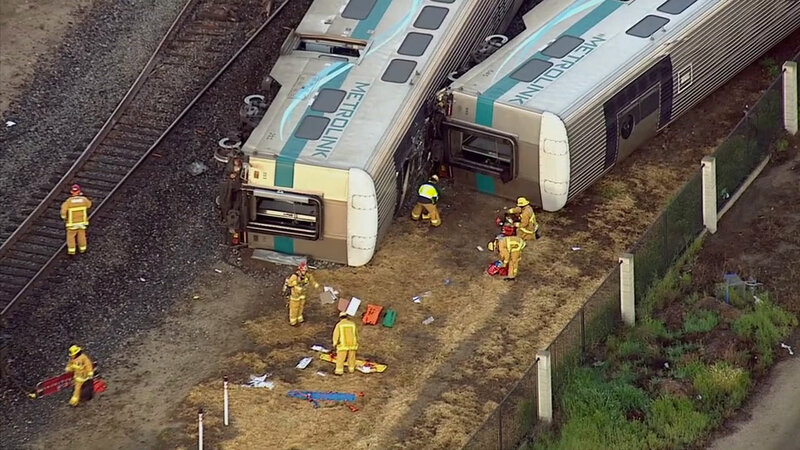 At least 28 people were injured Tuesday when a Metrolink commuter train struck a large pickup truck, which was hauling a trailer, on the tracks in Oxnard. Four victims were listed in critical condition. A total of 49 people were on the train, including 46 passengers and three crew members. 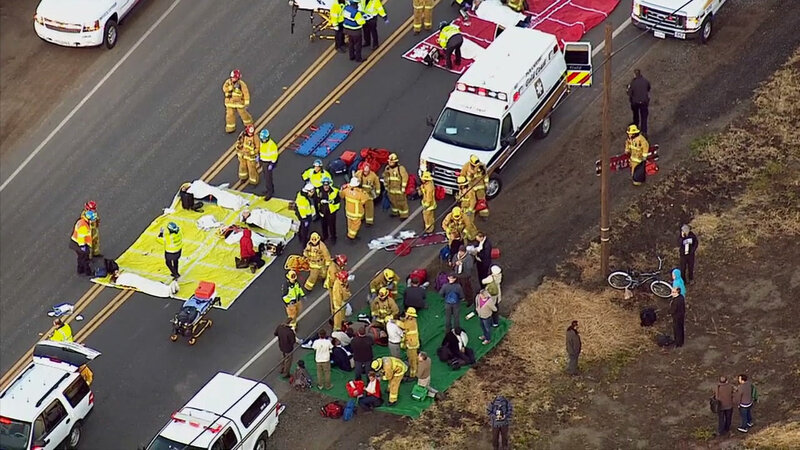 Authorities say 28 people were taken to area hospitals, with four in critical condition. One of the four in critical condition was the train engineer. The conductor and his assistant were treated and released. Metrolink spokesman Jeff Lustgarten credited crash safety technology to softening the blow of the collision. About two-thirds of the Metrolink fleet is 5 years old or less and is equipped with the technology. "We can safely say the technology worked. It definitely minimized the impact," Lustgarten said. "It would have been much worse without it." The National Transportation Safety Board has sent a team to investigate the crash. "[Federal Railroad Administration investigators] will conduct a thorough investigation to determine the factors that contributed to this accident. Safety must be every railroad's absolute top priority and we will establish what lapses, if any, occurred and order any necessary corrective actions," a spokesman for the Federal Railroad Administration said. Experts will investigate if the crossing arms were working properly. They will also check the train's recorders. Authorities are optimistic the train had inward and outward facing cameras. Approximately 24 freight trains and four passenger trains pass through the track near 5th Street and Rice Avenue per day, said Constance Gordon, a spokeswoman for the California Public Utilities Commission. There have been 11 incidents on this specific crossing in the last 10 years, not including the incident which occurred Tuesday. The last incident occurred on June 3, 2014. Gordon said two people were killed. The train tracks appeared to be heavily damaged following the crash Tuesday, which caused delays and cancellations for Metrolink and Amtrak trains. Amtrak train service between Los Angeles and Goleta was suspended for Tuesday. Regularly scheduled Metrolink service continued between Union Station in Los Angeles and Moorpark. Buses were provided for passengers traveling beyond Moorpark, with stops at Camarillo, Oxnard and east Ventura. Repairs could take several months, Lustgarten said. For information related to passengers, Metrolink urged the public to call (877) 248-8381 or visit http://ht.ly/JAW5c. Drivers were asked to avoid the area. Rice Avenue was closed between Sturgis and Wooley roads. Fifth Street was shut down between Rose Avenue and Del Norte Boulevard. Eastman and Rice avenues were also blocked.